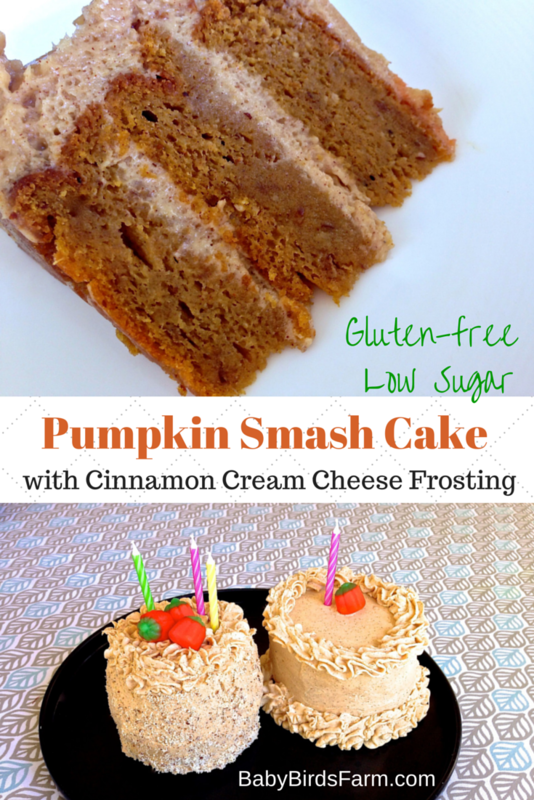 I’m very excited to share the recipe I developed for a healthy and delicious pumpkin smash cake! Baby Bird’s Banana Smash Cake is one of my most popular posts on Pinterest and in search engines. It is a healthy cake with no refined sugar or artificial coloring. This year we went pumpkin picking to celebrate both our youngest Baby Bird turning 1 and Little Bird turning 3. So of course we had to have a PUMPKIN smash cake and pumpkin cup cakes. I kept the sugar low by using just half a cup of maple sugar. Although we are not gluten-free, so many of our friends are. To be perfectly honest: these came out BETTER than the traditional cup cakes I made for the guests. The cinnamon frosting is mostly cream cheese with a little grass-fed butter. I wanted to use maple syrup to sweeten it, but we were out. I ended up using a little organic powdered sugar, but less than a quarter of what most recipes call for. Our pumpkin picking party fell on an unseasonably hot 100° day… the candy pumpkins on top of the smash cakes started melting. But the cake was delicious and I can’t wait to make it again! Maybe as a full-sized layer cake. Prep: Let all ingredients for the pumpkin smash cake sit out at room temperature. Cut a circle of parchment paper to line the bottom of 1 or 2 ramekins. Grease well with butter. Line a muffin tin with a dozen cupcake liners for the rest of the batter. Preheat oven to 350° F.
Scoop into the ramekins and any remaining batter into the muffin tin. Bake the muffin/cupcakes for about 15-20 minutes and the ramekins for about 40 minutes. Cool completely or even overnight before frosting with Cinnamon Cream Cheese Frosting. Our girls are at the stage where we have to have two of everything! So the 3-year-old got a smash cake, too. If you follow this blog, you will know that I am all about making things from scratch. They only time I have mentioned using a mix for anything was when I made my own pancake mix to take camping! But I have to say, I loved using this gluten-free mix! I have had so many not so great gluten free baked goods, and tend to avoid them. This mix is a household staple as Papa Bird uses it at least weekly for his special pancakes. It was nearly a year before I realized it was gluten-free! I am not affiliated with Pamela’s, although maybe I should be! I am an Amazon Affiliate, though, and do receive advertising fees for qualifying purchases made through links on this site. Thank you for your support! 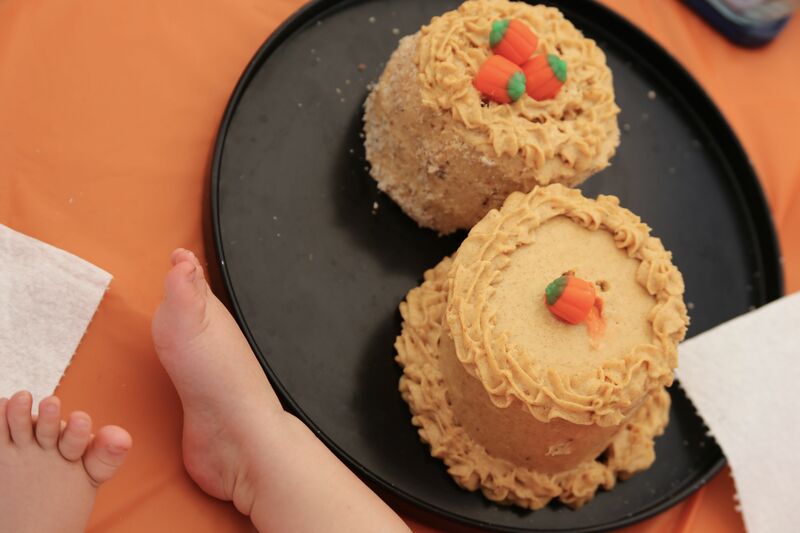 A low-sugar, gluten-free pumpkin cake or cup cake recipe, perfect for a healthy 1st birthday party "smash cake." Let all ingredients for the pumpkin smash cake sit out at room temperature. Cut a circle of parchment paper to line the bottom of 1 or 2 ramekins. Grease well with butter. Line a muffin tin with a dozen cupcake liners for the rest of the batter. Preheat oven to 350° F.
In the bowl of a good mixer, add butter and maple sugar. Beat on high until light and fluffy. Add eggs one at a time, mixing after each until well combined. Add milk and yogurt and mix well. Add 1 cup of Pamela’s Baking and Pancake Mix and the pumpkin pie spice blend. Mix on slowest speed until just incorporated, then add the pureed, cooked pumpkin. Mix until incorporated, then add 1 more cup of Pamela’s Baking and Pancake Mix. This entry was posted in Dessert, Food, Healthy Recipes, Our Family, Parenting, Recipes for the Whole Family, Recipes from the Garden, Recipes to Make with the Kids, Seasonal Recipes and tagged dessert recipes, easy seasonal cooking, easy seasonal recipes, gluten free baking, naturally gluten free. Bookmark the permalink. Thank you, Jennifer! Please let me know if you do. Perhaps your little man’s first birthday might be the time to try? You only have one little critic to try to please, and his body of reference, as in other cakes he has had, is probably small. Maybe it will be the best cake he’s ever had in his whole life! That looks delish. Pinned it! Thank you, Katie!! I hope you and your fellow pinners enjoy it! Thank you Elena! What is your name on Pinterest? Love to follow you. I am baby birds farm. Thanks Danielle! Soon we will have to share a slice. Look yummy, I am all about pumpkin this month, pumpkin with low sugar is even better. Thank you Amanda! I promise you you and your family will not miss the sugar. And I never use any fake sugar or sugar substitutes. Yum, who can resist cream cheese frosting, Brandon? I love pumpkin. These look so adorable and delicious! I can’t wait to try these. Aw, thank you, Angela! If you do try them, please let me know how they turn out! Looove the idea of maple syrup in lieu of white sugar. I bet it is a fabulous cake. It’s on my list to make. Thank you Jenny! It was delicious and I can’t wait to make it again. As long as gluten isn’t an issue for you, just use the same amount of all-purpose flour, and add a teaspoon of baking powder and a sprinkle of salt.